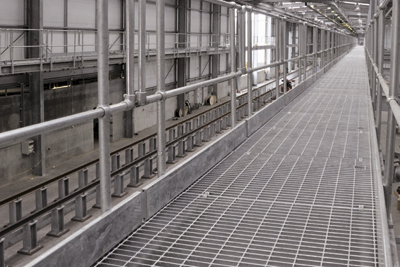 Protective barriers on open sides of walkways and platforms should, in part, consist of a kick-flat ( or toe-board ) to restrict objects falling from height and causing possible injury. Guardrail’s “C” section kick-flat is usually available Galvanised in 3000mm ex-stock lengths which can be cut on site or shop-fabricated to suit Customer requirements. The system is easy to install and can be “retro” fitted using our range of connectors, joints and end caps. The system is also available in Aluminium and Stainless Steel. Click to download our Guardrail brochure for further details. Thank you for your inquiry, you will hear from us as soon as possible.